Technology, by and large, is the easy part, added Banting, who is a principal analyst at Ovum focused on workspace services. Achieving business value, especially as relates to digital transformation, requires a mix of strategy, culture, leadership, and the ability to deliver outcomes, he said. With this in mind, Banting assessed what he heard and saw around UC&C last month at Enterprise Connect 2019 for sharing during the Ovum debriefing, which also featured contact center/customer experience-centric insight from Ken Landoline, principal analyst for customer engagement, and contributions from Mila Antonia, another principal analyst for customer engagement. For their full rundowns, watch the webinar and download the slides; here I’ll highlight Banting’s key UC&C technology trend takeaways from the event -- as loosely mapped in purple on his bell curve below. Use of the cloud for communications and collaboration services is ramping up quickly, and as such was a strong focus at EC19, Banting said. And what’s becoming increasingly clear is that enterprises are starting to gravitate toward cloud-based suites rather than best-of-breed technology. “Enterprises haven't got the resources, or indeed the money, to subscribe to multiple services,” he noted. “And the administration and management is far easier in an integrated suite rather than having different relationships with different vendors or different partners.” This trend is boding well for Microsoft with Office 365, Google with G Suite, Cisco with its Flex plan, and the like, he added. That said, the battle of cloud suites is really a battle for mindshare, Banting said. This was particularly apparent in during the Microsoft and Cisco keynotes, with the companies’ respective “intelligent communications” and “cognitive collaboration” messaging coming across loud and clear, he said. 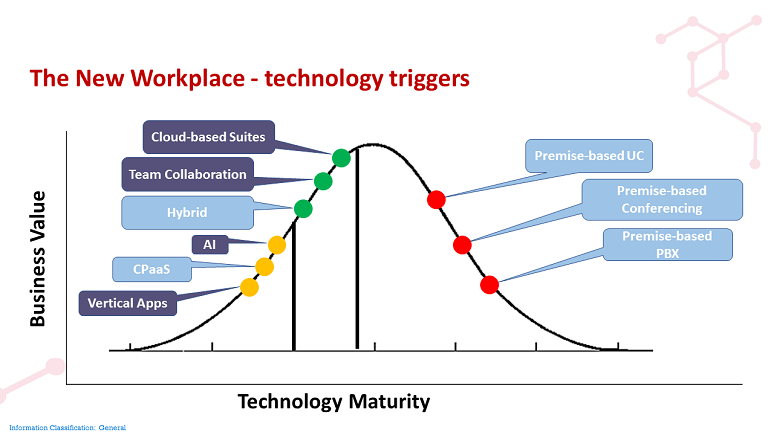 Interestingly, however, as much as cloud suites are becoming the go-to option for enterprise IT buyers, many of the executives at large companies Banting said he spoke with at Enterprise Connect admitted that they’re dealing with a variety of applications and services from different vendors -- perhaps some Webex here and Skype for Business, Slack, or Zoom over there. What’s more, they indicated that they’re likely to support this mixed estate for quite some time. This situation makes integration a “highly sought-after customer requirement,” Banting said. “Yet vendors haven’t really addressed it -- perhaps because doing so isn’t in their best interests as they look to maximize wallet share with best-of-suite solutions, he added. One way in which vendors are getting at the integration challenge, in piecemeal fashion at least, is by creating versions of their apps catered to particular vertical markets. Microsoft exemplified this verticalization trend with bespoke Teams developments around retail, with integration to scheduling software, and in healthcare, with linkages to electronic medical records, Banting said. But from where he sits, Banting said he sees the verticalization trend on a collision course with another trending technology promising to provide value for tomorrow -- that being communications platform as a service (CPaaS). As an example, he pointed to an announcement coming out of EC19 that saw AT&T teaming with CPaaS provider Ribbon Communications in creating an API store that provides ready access to pre-packaged code that developers can use to create their own vertical applications for specific use cases. Another example comes from Bandwidth, which is providing enterprise-grade voice and 911 capabilities. “It can provide a CPaaS offering for back-end infrastructure that developers then don’t have to worry about,” he said. AI: What Does It Really Mean for UC&C? Of course, no Enterprise Connect recap is complete without a discussion of AI, a dominant theme at this year’s event, as Banting pointed out. But to him, Banting noted, AI in UC&C stands more for “’artificially inflated,’ rather than ‘actionable insights’” -- and that, he added, is due to where AI sits along the technology adoption bell curve. While “employee productivity” tops the list of perceived AI benefits among respondents of Ovum’s global Workspace Services Survey, as shown below, relevant discussions at EC19 “were tenuous, at best, and they didn't really get toward providing a way in which an enterprise can gain actionable insights,” he explained. For example, during its keynote (watch here), Cisco demonstrated intelligent framing of video meeting participants, which helps to improve the employee experience and provide a participant count. But the demo fell short on showing the way in which counting the number of people in a room could lead to insights for facilities managers, say, as they’re determining how to optimize meeting spaces, Banting said. While EC attendees were treated to plenty of incremental capabilities such as intelligent framing or real-time translation services, as shown by Microsoft, AI-related product announcements coming out of the event by and large show that AI has “not yet crossed the chasm,” he said. On the other hand, as Ovum’s Landoline shared during his portion of the debrief webinar, AI has made the leap in delivering improved customer experiences in the contact center environment. Watch now to hear more on this front. Love Tim Banting's observations about integration and interoperability. This issue came up in our Thursday general session about collaborating in the workplace of the future, when an audience member asked the question of the panel of vendor executives: When is this stuff going to work together? The sheer volume of applause from the audience when he asked this question is evidence enough that there's a "mounting frustration" over the lack of integration.